Real Eyes sent a little Christmas gift to group members! Lovely soft eyes in a neutral tone with a glittery sclera. They are system only in one iris size. Group members can find the gift in the group notices & more gifts are available at the store. Group is free to join! For down-to-the-wire gift ideas, try your luck at the Merry Crisis gachas! Chop Shop has a unique eye gacha there with a lot of eyes to play for. Lucky me got the Holiday – Ultra Rare in red & green! Each eye comes with system & mesh versions in a large iris size. If your friends & family love oversized & glossy doll-like eyes, play a few times to get these for gifts since they are transferable. Only $50L per spin. Good Luck! Beautiful Freak @ Gothmas by Gaslight has a wintry gacha to play! 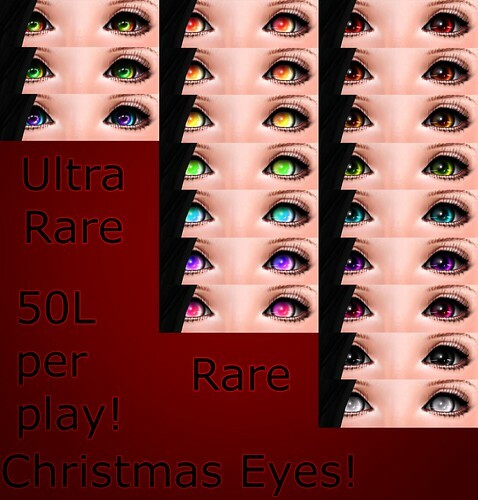 Ten icy eyes to play for, each has system & prim versions in one iris size. I won the Ice rare but if you’re lucky, you could win the whole fat pack! Gacha price is only $15L a spin so good luck! Also check out the lovely dark winter scenery & shops with specials, gachas, & a few gifts on two sims! Hurry over to Adoness’ Christmas Market for some holiday deals & gifts! Cruella has six special eyes in her market for only $20L each. They come with system & mesh versions with eye glow options. She also left gifts around the market, one of which are these multi-golden eyes. They also comes with system & mesh versions. There are more gifts ranging from $0L to $10L and specials on clothing, accessories, & hair. Christmas is almost here, so hurry over to Umeboshi & join the group to get this holiday gift! The gift features four brown & blue eyes with system & mesh versions in one iris size. Group members can find the gift on the wall across from the service desk. Grab this holiday gift from AVELINE! Lovely ornament red & green eyes perfect for the holiday season. It has system & mesh versions with five iris sizes from XL to XS. Special Christmas gift out at Poetic Colors! Beautiful holiday green eyes with gold flecks in system & mesh versions. Featuring three iris sizes and three sclera (eye white) shades. The mesh eyes are resize scripted for fitting. Gift is free for everyone! Woot! I’m participating in the 25 for 25 Hunt December round! My hunt prize features wintry bauble eyes in five festive colors with matching makeups. The eyes have three iris sizes with system, prim, & mesh versions. The hunt prizes cost $25L & there is a lot of great stuff to find! Hints & Previews are available on [ free bird ]’s 25 for 25 Hunt post. Find them at my ~*By Snow*~ store inworld! LAST CALL to snag the massive amount of group Christmas gifts from JeSyLiLO! Have a New Year’s Eve makeover with male & female skins, makeups, clothing, shoes, accessories, hair, & eyes in one hundred gift packages throughout the store. If you ever missed a hunt, event, or group gift, now is the time to catch up. The group fee is paltry compared to the amount & quality of the gifts. Hurry hurry before they are gone! Be safe tonight in your New Year’s celebrations!